Evolved gas analysis (EGA) is a method used to study the gas evolved from a heated sample that undergoes decomposition or desorption. It is possible to analyze explicitly which gases evolved using EGA. 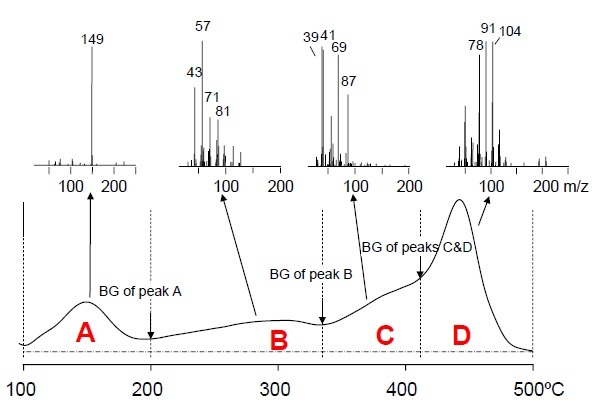 Therefor different analytical methods can be employed such as gas chromatography-mass spectrometry to analyze different gases produced from a material. EGA is a useful technique in determining the complexity of a sample as well as determining thermal zones of interest. Using mass spectrometry a single extracted ion can be monitored to pick out compounds or groups of compounds of interest. This can then be followed up with specific GC/MS runs for a more detailed analysis of each thermal event.